latest review: Review: Tame Impala and Mini Mansions - Sydney Opera House Forecourt, November 2015. Music Watch: Tame Impala perform new songs on Saturday Night Live. 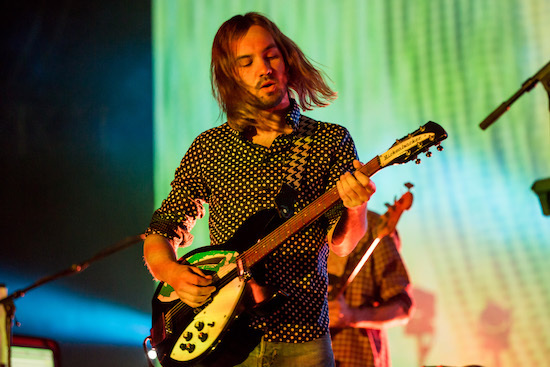 Music Watch: Tame Impala perform 'Love/Paranoia' live on The Tonight Show. Music Interview: Jay Watson and Joe Keery on everything important and everything in between. Music Watch: Tame Impala’s Doctor Who version of 'Elephant'. Music Tame Impala - 'The Less I Know the Better' live for Jimmy Kimmel. Music Gum - 'Elafonissi Blue' music video. Music Listen to Tame Impala's Kevin Parker's remix of Gum's 'Anesthetized Lesson'. Music Miguel - 'Waves' (Tame Impala remix) music video. Music Interview: Gum's Jay Watson on his sophomore album, 'Glamorous Damage'. Music Tame Impala - 'The Less I Know The Better' music video. Music Review: Tame Impala - Logan Campbell Centre, November 2015. Music Review: Tame Impala and Mini Mansions - Sydney Opera House Forecourt, November 2015. Music Tame Impala - 'Let It Happen' music video. Music Must-listen: Haim's remix of 'Cause I'm A Man' [but with Haim vocals]! Music Tame Impala become puppets in their new 'Cause I'm A Man' music video. Music Mini Mansions + Tame Impala's Cam Avery performing 'Any Emotions' together live. Music Tame Impala - ‘Cause I’m A Man’ music video. Music Watch Pond's wacky 'Man It Feels Like Space Again' music video. Music Must-watch: Arctic Monkeys covering Tame Impala’s 'Feels Like We Only Go Backwards’.